I love eggplant wholeheartedly at it does not appear to love me back, since it refuses to look pretty for the camera. wealthy enough to afford more eggplant. Point is, I love the stuff. It’s still winter squash season, and I have NOT given up on my second love; however, when a wonderfully kind gentleman brings you a 5 lb bag of eggplant, you squeal like a pig. Then promptly run home to cook eggplant. Eggplant will always have a special place in my heart, because, unlike winter squash, you don’t have to peel it before you cook it. Which means no bloody fingers. No time wasted searching for band-aids and settling on a combination of paper towels and electrical tape. There is no substitute for the adhesion and fashionableness of electrical tape. This recipe is ridiculously easy. I almost wanted to add more steps to liven it up, but I can’t. Those truly are the only steps. Also, much to my despair, the husband walked over the crockpot and ate half the dish- directly out the crockpot. I’m amazed he bothered with using silverware. I’m assuming that means it was edible. I can’t confirm, however, since he wouldn’t stop eating. 2. 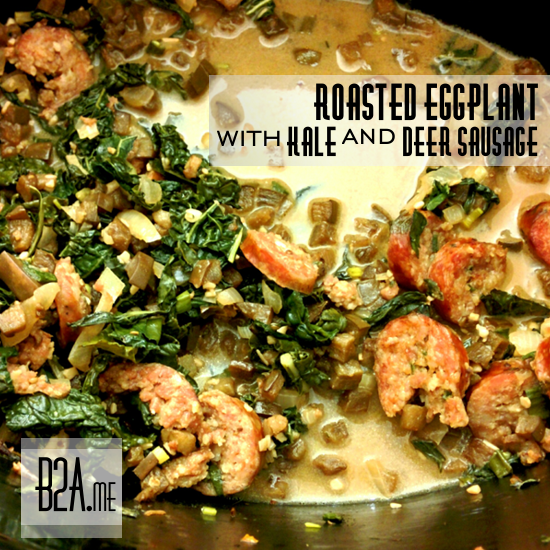 Add beef stock, kale, green onion, and deer sausage; cook until sausage is fully cooked. *Use any method desired to roast eggplant. On this particular occasion, I had no desire to wash additional dishes so I utilized my crockpot to roast the eggplant. I simply added the butter, garlic, and eggplant; set the crockpot on HIGH; and mixed up the crockpot contents every 10 minutes or so, until all the eggplant bits had darkened.